Greenbriar Picture Shows: Schnozzle's The Whole Show! Perfect Timing and What! --- No Beer? Keaton fascination never ends, it seems. Warner Instant has just added What --- No Beer? to its HD inventory, an immediate must-watch. I drank this Beer before and recalled it being stale, much of bad impression drummed in by book/docu describe of poor Buster as junior fiddle to Jimmy Durante brass and getting a Metro pink slip for his pains. All that still goes --- kindliest revision won't improve flat brew --- but somehow BK seems less debased this time 'round, and I'll even give Durante more quarter than previous. Let's keep the review bite-sized, then: What --- No Beer? is not a good comedy, but it isn't a despicable one. I even enjoyed moments here/there, a few of which find Buster hung over, that a modern perception based on what we know of at-time circumstance. Mostly he's OK, less lithe than before, but that's like comparing human against super-human strength, and how long could Keaton have maintained his amazing athleticism even spared the hobble of drink? He was, after all, 37 when What --- No Beer? was made. I want to get chronology right, because Buster's Metro nest fouled in a hurry and weeks matter in summarizing it. 1932 had played him bad. Natalie got the house and kept the boys, their names changed to Talmadge as crowning insult. 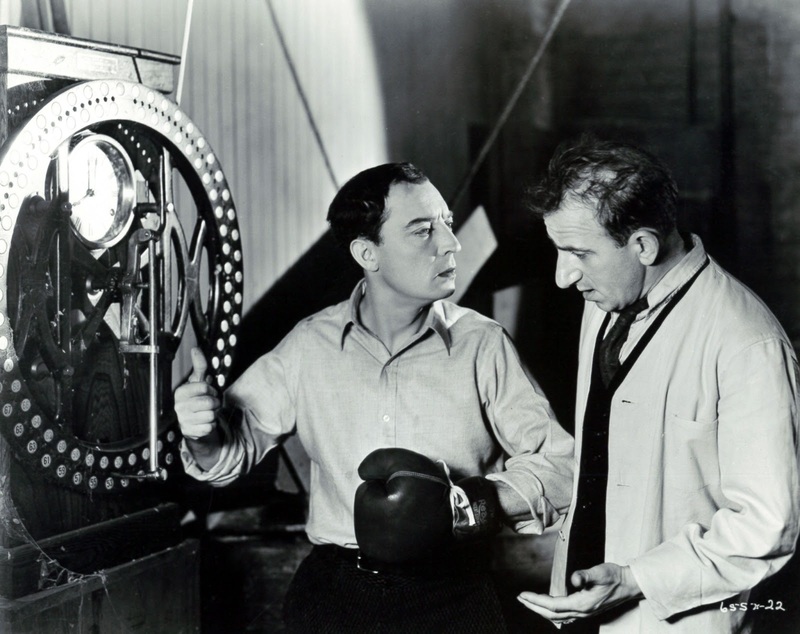 Keaton caused delay on Speak Easily and MGM made him pay back costs by partial withhold of stipend, this memorialized in a '32 contract that also wrested sole-star status and made way for Durante developing. The two were "teamed" further from here, difference being JD above the title alongside Keaton. Bad behavior escalated. A run-out to Mexico saw Buster return with a new wife, and to say a least, she lacked Nat's pedigree. There was also a drunken toot of an on-lot party that Louis Mayer was said to have interrupted (or was it a Buster-brawl in his bungalow with a disgruntled mistress?). Then there was a bosses' charity football invite that Keaton blew-off, accumulation of foregoing a final push on self-destruct's button. What! --- No Beer? was shot between December 17, 1932 and January 28, 1933. 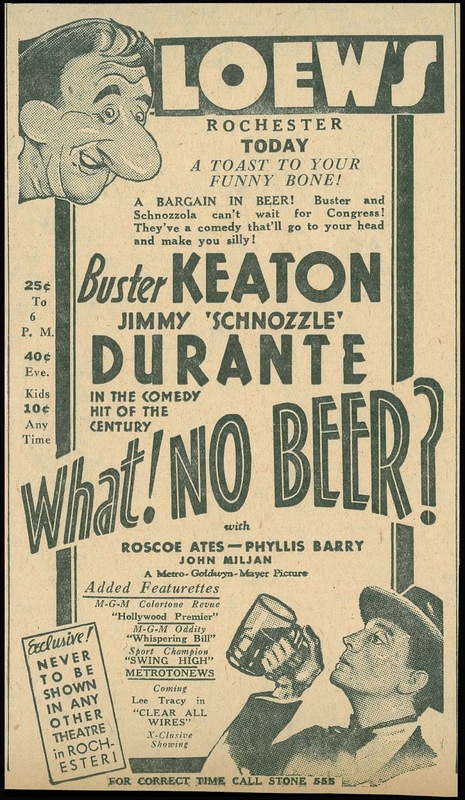 All Keaton's MGM stuff had been profitable, the more so now that Durante was aboard, so a bright idea announced in 12-31-32 trades put Jackie Cooper into comedy's triad. 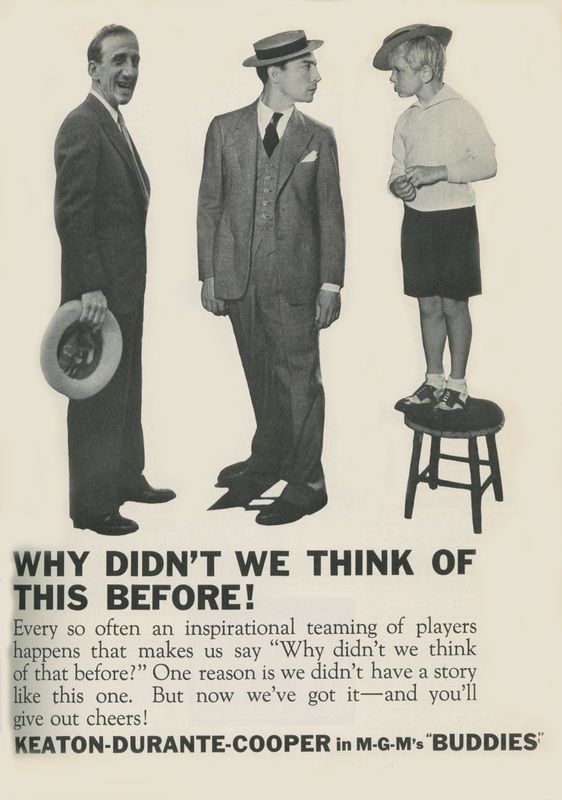 Keaton, Durante, and Cooper --- Why Didn't We Think Of This Before? It was a natural, and served with Ed Brophy, Cliff "Ukulele Ike" Edwards, or even Polly Moran, one fairly quivers at prospect here. Things must really have been bad, as Mayer forfeited all by stroke of a firing letter issued to Keaton on 2/2/33. What! --- No Beer? was done, and continuing guff wasn't worth it. Did Mayer act on temper rather than fiscal sense? Thalberg thought so on return from heart recovery. What! --- No Beer? 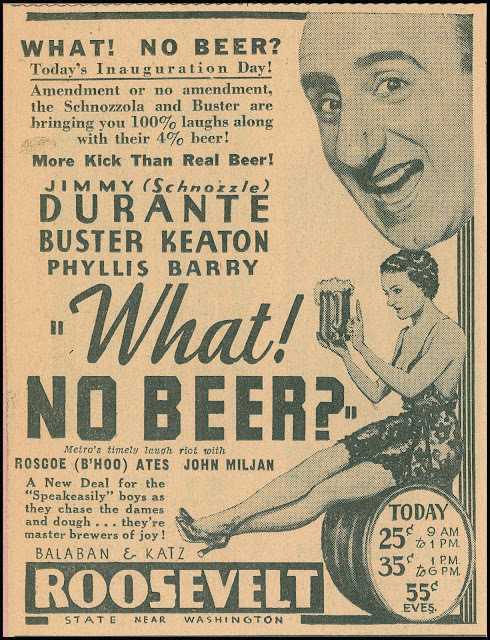 would come in for a splendid spike thanks to repeal of prohibition via passage of the 21st amendment on 12/5/32, with the first "legal" bottle of beer ceremoniously delivered to the White House on 4/14/33. Trades reported What! --- No Beer? as the first movie about the country's hottest topic, with release set for February, 1933. 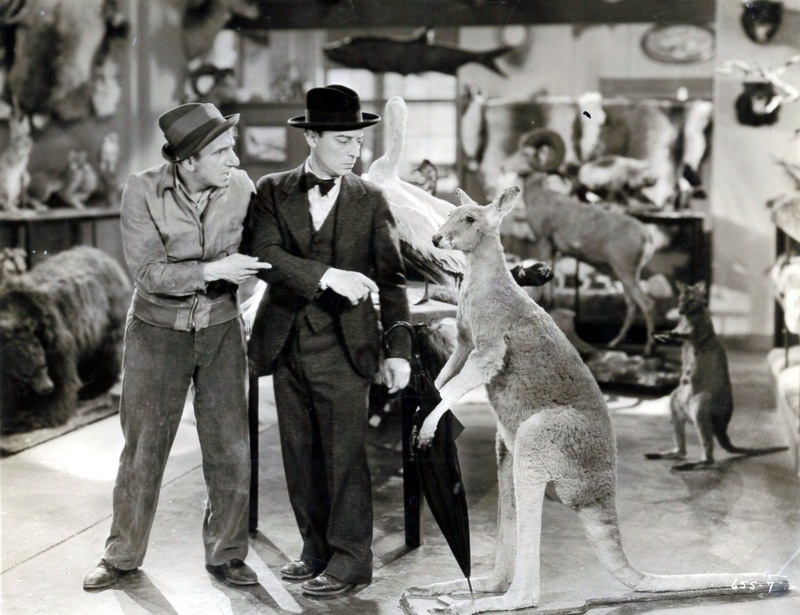 Variety announced Keaton departure from MGM in early February (2/3), saying it was Buster who wanted out. 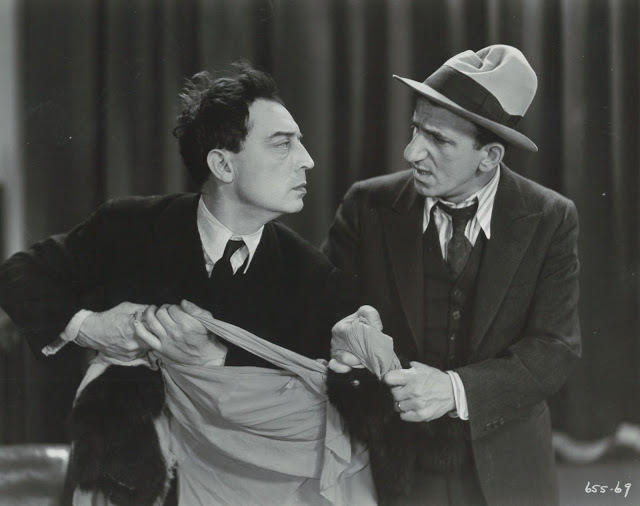 It was no surprise to studio officials when Keaton made the request for his release, said the trade, the comedian being put out by the fact that he had been reduced to co-starring by the company and also the fact that Jimmy Durante in the last two pictures they appeared in together had been given the juicier assignment. A final straw, said Variety, came when Keaton found that Durante was billed above him in What --- No Beer?. Coverage added that Keaton was not figured much on his American draw, but proved to be a money-maker for Metro in the foreign market, especially in England. 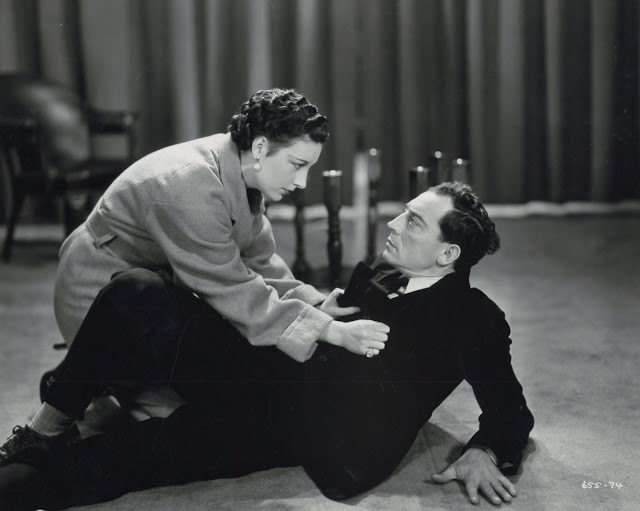 For all of fudging in the trade's report, the Keatons had done reasonably well in foreign markets, but no more so than, for instance, the Marie Dressler/Polly Moran comedies. In fact, the latter team's Prosperity got $348K in foreign to $289K collected by What! --- No Beer? beyond US borders. There was a preview for What! --- No Beer?, running at this point to 86 minutes. Variety suggested trims and Metro made them: final release was 65 minutes. The beer angle was sold to the skies. Pittsburgh's Penn Theatre put up a bar in the lobby to serve "near-beer" to incoming patrons (the real stuff couldn't be dispersed for another couple of months), the bartender a known face to locals since pre-Prohibition and maybe since in speakeasies. Jimmy Durante sent wires of support to both the venue and Pittsburgh critics. Had Jimmy noticed ads giving him prominence over Buster? Metro was letting it happen now that Keaton was out. Chicago's booking at the Roosevelt Theatre made positions clear, Durante billed first with his image adorning open day ads. The town's Atlas Brewery was approached to do a tie-in, but now that beer was coming back legit, the bottler wanted no part of sawdust and cuspidors formerly associated with suds. Their beverage would (they hoped) become a favorite of the elite, so any link with movies was carefully parsed for offending reference. New York's MGM flagship, the Capitol Theatre, had Ed Wynn's "Laugh Parade" troupe on stage and What! --- No Beer? for a two-week run beginning 2/25/33. Numbers were good, $53,100 for a first week, $40,000 in the second, but She Done Him Wrong at the Paramount walloped Wynn and Beer with an extra week and better returns. Elsewhere playdates got behind the timeliness of What! --- No Beer?. 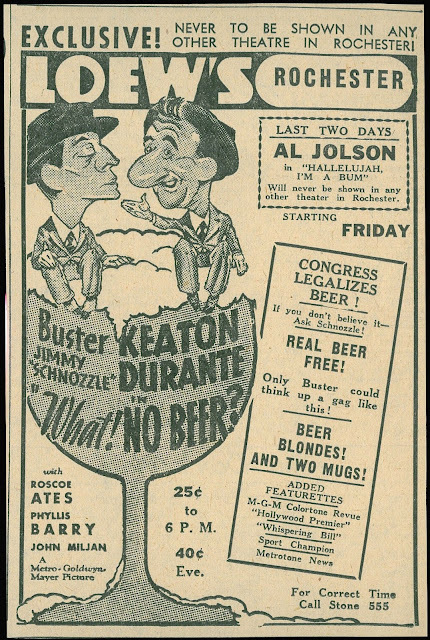 Rochester's Loew house rankled local showmen by declaring that Beer would never be served at any other theatre in town, a brag made possible by Metro's oft-withhold of hit pix from venues beyond ones they owned. This sort of advertising left patronage no apparent choice but to see What! --- No Beer? on Loew's first-run ticket pricing terms, with outlier neighborhoods left to wonder if they'd ever get it at all. Would subsequent runners be forever denied access to What! --- No Beer? Harrison's Reports lit into Loew's over this and too-high rentals for what it called "poor pictures" out of Metro. What! --- No Beer? ended up with $633K in worldwide rentals, well below the last two Keaton/Durantes (Speak Easily's $742K and The Passionate Plumber at $779K). Were the K&D's (or lately, D&K's) starting to play out in any event? Buster would keep busy post-Metro with Les roi des Champs-Élysées, produced in France, and a two-reel series for Educational back home. Admirers today would say he was better off at these than continuing at MGM. What! --- No Beer? meanwhile plays as a fascinating document of Buster's final weeks with Leo, and as backdrop to seismic shift brought by repeal of prohibition. Warner Instant gives us opportunity to HD-see it like never before. As Jimmy Durante says while sipping brew in a final What! --- No Beer? close-up, It's your turn next, folks. It won't be long now. Thanks for the trade ads. I've always suspected that the aborted Buster Keaton-Jimmy Durante-Jackie Cooper story BUDDIES might have ultimately become the Stan Laurel-Oliver Hardy-David Leland story NOTHING BUT TROUBLE. Keaton did work on the NOTHING BUT TROUBLE script, and maybe he remembered the basic setup of BUDDIES. I can see M-G-M making Jackie Cooper a poor little rich kid opposite the lowbrow Buster and Jimmy. 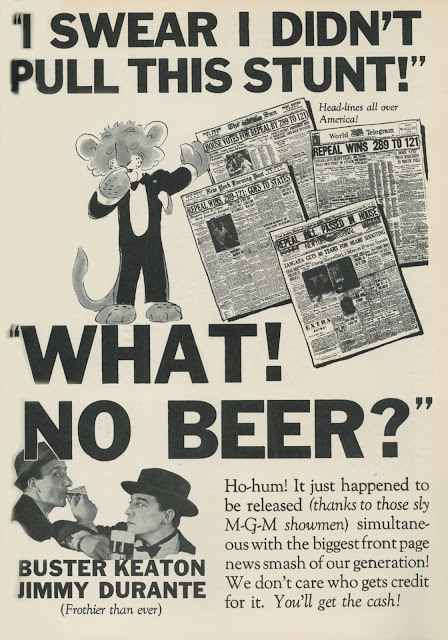 I couldn't find any further mention of BUDDIES during my research for "Laurel & Hardy: From the Forties Forward," so -- as tempting as it was to float BUDDIES as a possible genesis of NOTHING BUT TROUBLE -- I couldn't prove it so I didn't print it. Painful is the only word that comes to my mind when watching buster's MGM talkies. Painful because they made more money than did Buster's silent features as a result of better distribution not as a result of being better pictures so any hope Buster had of turning things around creatively for the better at MGM (Mighty Gawdawful Movies) was dashed on the rocks of better box office. Painful because even the best of them (DOUGHBOYS) falls short of the mark. Painful because Keaton, unlike Chaplin, never became his own producer. Painful because in his later years Keaton was completely unable to employ his gifts. I bought them all to be able to see them. I just can't stand to look at them. That goes for the Educationals and the Columbia shorts as well. The best moment in his post MGM career, for my buck, is THE RAILRODDER which Keaton did for the NFB and that is because, credits in the trash where they belong (I met the man credited with directing that. 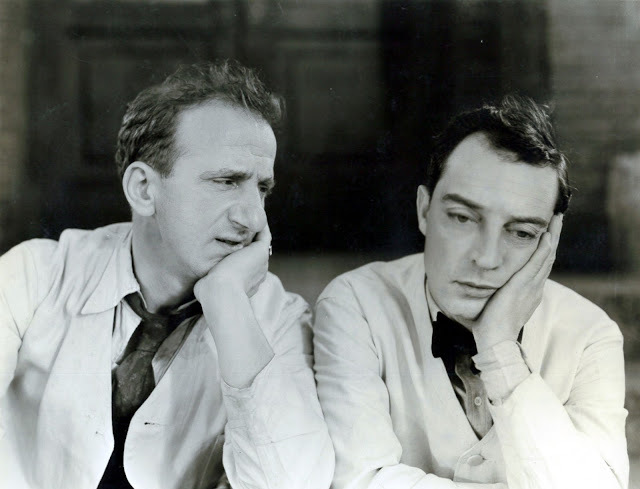 He personally thought of Buster as washed up), it is a complete Keaton work. If only others had given him the freedom no one will give us and each of us has to seize. All that to the side, another great post. Thanks. Just like you, John, I jumped on WHAT! NO BEER? as soon as it popped up Warner Instant. Hadn't seen the whole thing in decades. I must confess I find Buster's three with Jimmy the most watchable of his MGM talkies, and, now, might even pick BEER as the best of the bunch. Oh, it's a mess - but there are little bits here and there (a few great falls, some funny walks, takes and those damn barrels) that remind you of Keaton in high gear. I just wish he had slept things off a bit before cameras rolled. On the other hand, like some, I have always been a little mystified by the high regard for SPEAK EASILY in some quarters. How Maltin ranked that one higher than THE NAVIGATOR, GO WEST and BATTLING BUTLER goes right through and over my head. 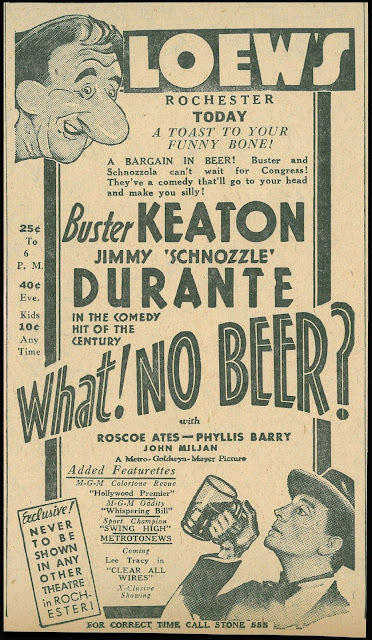 Buster, for one, apparently liked SPEAK EASILY; when he returned to the Metro lot in the late forties, he was apparently trying to drum up interest in a remake, with himself and Durante reprising their roles in gorgeous Technicolor. As for WHAT! NO BEER? poor Buster looks more snockered in some of those publicity shots than he does in the movie. Apparently still cameras are truly incapable of lying. Buster did some other good things in the years between Columbia and "Railrodder". Man, I've tried to get through a couple of those Keaton/Durante movies, but never made it past three minutes. I found them physically painful to watch. At least when John Gilbert appears to be drunk, he's playing a drunk, and quite well. Keaton, though, is not only drunk but hamstrung by Durante, a lackluster script and near-zero creative input. And these were more popular than his silents? Yikes.